Why did I do this? That is something I always want to ask my self, especially when I am doing something new. If I don’t know they why, how can I expect my students to understand what we are doing. I blogged about why I am trying to do this in my #OneWord2018 Challenge here. One of my biggest goals is that I want students to own their learning. I felt like this class needed to try something different as what I was doing wasn’t getting them excited for math. This lets me to try this model out with one class and see if it is worth doing with my other classes. I made a class website to help facilitate everything. Check out the site here. I would love feedback. Please let me know if you catch any errors or broken links. Students watch a video in a google form then take a self check quiz in that form. The quiz grades it live and I provided video links for review for each problem. Before they can Quiz they must get a 100% on the self check quiz in google forms. There is infinite amount of re-takes. Pacing Guide used to help keep students on track. Students take a Quizizz everyday coming into class. The quiz is just simple vocab from that unit. After we review common missed mistakes. My biggest reservation about moving to this model is I felt the classroom would make it less interactive. I am trying to think about ways to include 3-act math lessons and other collaborative activities. I think for the class to work correctly students who need extra time will need to be given time in the summer to catch up. Not sure if my school will allow that. So I have three students who passed PQ 1& 2 and are on PQ 3, 1 student who quizzed on PQ 1 & 2 and needs to do a corrective assignment, and 2 students who still need to quiz over PQ 1. One of the students who has done the self check quiz in google forms at least once and the other hasn’t taken it once. I like that students are progressing at their own pass. I have been able to give more feedback to the students. It takes more work to build a website and organize content then I thought. Like that google forms can give instant feedback with links for help. Trying to make all the practice problems available online. No need for paper or to print out anything. Not sure If I need to make the practice and explore part required. Right now I am making it optional. I thought that if a student watched the video and understands the material I don’t want to waste their time with what might be viewed as busy work. I also want to create a mindset where the students want to do practice and improve. It will be impossible to get a score less than an 80% in my class. * Mastery by 80+ % is the only reasonable criterion for courses and schools. * Students learn at different rates. They need differing amounts of time and practice to learn any lesson. * Therefore, group-paced instruction cannot, in general, produce high-level outcomes. 1. one-on-one tutoring, too expensive in almost all cases. 2. flipped (self-paced) classes. Delivers much better outcomes for teacher up to making the change and schools flexible enough to allow this to happen. 3. Students with the competence and confidence to hold themselves to a mastery criterion in conventional, group-paced classes. These are the A students. Most of them get A’s by practicing to mastery rather than by inherent genius. Good Student Success courses can convert students from the B-C-D levels to A-level. Peter, great reasons for why flipping makes sense to you. Do you do any DI in your flipping? The one-on-one help I can give to my students greatly helps my students. However, I have a good chunk of students who are complacent and do not ask for help or will not receive help. What do you do to help these students? I am also struggling right now because every one of my students is behind the pacing guide. I think this is why I don’t like the term “Self-Paced”. Would love tips or suggestions of what you do to keep your students on track? I also have students who might not ask for help, but you have to know who they are and just talk to them about asking for help. They will be more accustomed to asking for help if you reach out first. I struggled with the pacing guide also at first and still kind of do. There are students who will be really off pace and behind, but those are the students who you will have to spend more time with. I don’t believe that the math is issue for most students, it is more the time management that goes into this style of learning. This is what students really need help on. Ultimately each student is there to learn the material throughout the length of the course and with the flipped approach there really aren’t excuses anymore. Kids have more accountability than they have ever had before with this style. 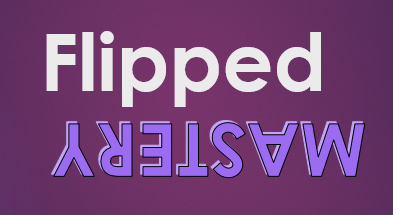 Flippedmath.com is a great resource for flipped mastery. I flipped all of my classes. Algebra 1 through AP calculus with this website. I started recording my own videos and modeled them after the videos on that site. Here is my Algebra 2 Google site. Explore around. Joe, Great site. Some items I could not view, but like the layout. I think I might change the way I have mine setup to have each unit in the navigation bar. Would love to see your Algebra 1 and Geometry site if you have one. I am always curious how other flippers are doing master checks? Do you do a 5 question quiz after each skill like the Algebros? I have been recently thinking of letting the students self-assess during the mastery check. Students quiz, I give feedback, then students self-assess and either say I need to do a corrective assignment or move on. My other sites are basically gone now because my district is shifting to Powerschool, so I took those other sites off line. They basically looked the same though. The mastery checks I use are either 5 or 6 questions. If the students get 1 question wrong they still pass, any more than that and they fail and I give them a retake assignment after I went over what they did wrong with them right there. Depending upon what they got wrong I will adjust the retake assignment to what they need the most. I don’t know if I would have the students self assess. If you are doing that, there might be students who think they have the right answer, but really do not. My retake tickets have the answers on the back and you would be surprised when students don’t check the answers even though they are right there. In My Self-assessment- students still get feedback from me. I let them know what problems they got right and wrong and give them diagnostic feedback. The then self-score their understanding of the skill based on a 5-10 rubric we have. I think when students self-assess that is a more powerful way to get students to own their learning.